Emergency Dentists USA has a comprehensive list of Huntsville emergency dentists who are standing by to make your dental emergency a thing of the past. Carefully selected and listed in a simple format, the Emergency Dentists USA Huntsville emergency dentists offer office hours that suit your dental needs, regardless of the emergency type. Use our 24-hour dental emergency hotline to speak to a live operator who can assist you in choosing a great dentist and help you to schedule your first appointment. The operators at Emergency Dentists USA were fantastic. I could hardly talk due to the pain in my mouth, but with minimal information from me, they were able to find a dentist close to where I live. They even contacted that dentist for me to help make an appointment. I can’t thank them enough! Our comprehensive listing of emergency dentists provides you with the exact dental experience that you are searching for without the actual search. Dr. Michael Mann at Huntsville Dentists offers walk-in patient services for anyone with a dental emergency, which is great if you aren’t able to wait for an appointment. Clinics that specialize in being open 24 hours a day are not available in Huntsville, but hospital emergency rooms are always open and ready to take in patients with dental problems. After hours dental clinics are common in Huntsville with many clinics offering evening or early morning appointments along with weekend hours for those who just cannot wait until Monday to see a dentist. Complete Dental has after-hours appointments until 7 pm for anyone with dental needs that are outside of the normal office hours. On Emergency Dentists USA, finding the right Huntsville emergency dentist for your dental needs is a breeze. Simply scroll through the Huntsville emergency dentists listed below and choose the dentist with office hours or an office location that is convenient for you. Or call our 24-hour dental hotline to speak with a friendly operator who can help to set up that first dental appointment. Description: Call to be connected with the perfect dentist for you. 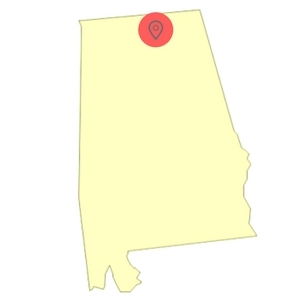 Huntsville is a large city and we have the connections to find a dentist to fit your needs, and can get you an appointment immediately. Description: With 14 years of experience in handling all types of emergency dental matters that can unexpectedly crop up in one’s life, this top-notch dental practice is in the business of ensuring you get immediate relief from whatever pain you suffer from. Their hours extend to 7 pm during weekdays and they offer Saturday hours as well making them a great choice for a Saturday dentist. Description: Dentistry Today offers conservative care with the highest quality equipment, materials, and techniques. Dr. Leslie Barrilleaux and Dr. Darren Barrilleaux are always standing by to solve any dental problem. Office hours that extend until 8 p.m. on Wednesday Saturday hours make it easy to see a wonderful Huntsville dentist without suffering for longer than is necessary. Description: At Dental Care of Huntsville in case of a dental emergency, you can have the peace of mind that you have professionals to assist you quickly and efficiently. This clinic is a great choice as they have extended office hours every night of the week, making them the perfect choice for an after-hours clinic in Huntsville. Description: With an outstanding background in providing general, restorative, and cosmetic dentistry, Dr. Mann is well equipped to treat any ailment. With early morning appointments available, this is a great choice if you are needing to get into the dentist before work hours. – Have your paperwork, health records, and insurance information ready for your first dental visit. This information helps your new dentist to provide you with the best possible care. – Try to arrive early to your dental appointment to ensure that you have plenty of time to ask questions and fill out the necessary paperwork. – Make sure you know how you’re going to pay for your dental care. Most Huntsville emergency dentists accept cash, personal checks, credit cards and some even offer low-interest payment plans for more extensive services. – Make sure you know if your insurance is accepted at this dentist. – Bring a current list of your medications with you to see your Huntsville emergency dentist. Some of the most common dental emergencies include lost fillings, chipped or broken teeth and teeth that are completely knocked out of the gum. Dental emergencies also include broken wires or brackets on your braces, loose or lost crowns, and soft tissue injuries to the mouth, the lips and the cheeks and gums. 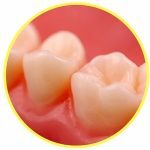 Each dental situation is unique and you should see an emergency dentist in Huntsville for any of the situations described below. 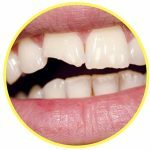 A lost filling is a common dental emergency that can become quite painful. When a filling is lost, the sensitive internal structure of the tooth might be exposed to food particles. You can use a small piece of sugarless gum to fill the hole in the tooth and to protect the tooth from pressure caused by chewing food. Sometimes a lost filling is not painful as the decay has not reached the sensitive portion of the tooth. A chipped or broken tooth is one of the most common of all dental emergencies. If you are able to find the broken portion of the tooth, bring that portion with you to the dental office. Rinse your mouth with plain water and use a moistened piece of gauze to control any bleeding. A cold compress on the outside of your mouth can help to lessen the pain or swelling caused by the chipped or broken tooth. Tooth trauma caused by an accident might come from a sports injury or a fall. This type of trauma can include broken teeth or teeth that are knocked out completely. In most cases, tooth trauma caused by a fall or accident should be evaluated by a hospital emergency room physician to ensure that you do not have more dangerous bodily injuries. Use a cold compress applied to the outside of the mouth to lessen pain and swelling. You might require an emergency tooth extraction if your tooth has decayed to a point where a dentist is no longer able to repair the tooth. It is important to have the extraction accomplished as soon as possible in order to lessen the chances of pain and complications. Your dentist will usually begin the procedure by examining the tooth and taking an x-ray of the tooth. He or she then chooses a general or local anesthetic to ensure that you are comfortable throughout the procedure. A special tool is used to remove the tooth from the gum, and the gum is then stitched closed with a type of suture that dissolves over time. Following your emergency tooth extraction, it is important to take any medications prescribed by your Huntsville emergency dentist. Try to avoid drinking from a straw or eating hard foods for the first few days after the procedure. Avoid smoking or drinking alcohol until the gum is fully healed. It is extremely important to visit your hospital emergency room if you have a dental emergency that stems from a fall or a sports injury or accident. This ensures that you do not have more dangerous injuries. Keep in mind that most common dental emergencies can be handled in your Huntsville emergency dental clinic without the added hassle of spending time in the emergency room. Since many emergency rooms are not designed to treat dental problems, you may end up seeing your dentist following the ER visit. This means two bills and a larger expense for a treatment that might not have cost quite as much in your Huntsville emergency dental clinic. Choosing a great dentist takes time and effort. Use the American Dental Association’s website to ensure that your chosen dentist is certified and licensed in the Huntsville area. You can also access the Alabama Dental Association’s website to get great dental care advice and learn more about Alabama dentists.